We all face trials and situations which seem like, at the time, they will never end. We pray in earnest for resolution and it seems elusive. We can be in a struggle to survive, calling out to God and wondering if he is there. Soul Friend, you can know that he is there, he is listening and he is working. ​God is working in the midst of the storm. He is healing. He is cleansing. He is protecting. He is loving. He is delivering. If today finds you in the midst of a battle, my prayer for you is: endurance. Our one true souce of strength during these trials is God himself. And the best avenue to tap into God's strength is throuh The Word. 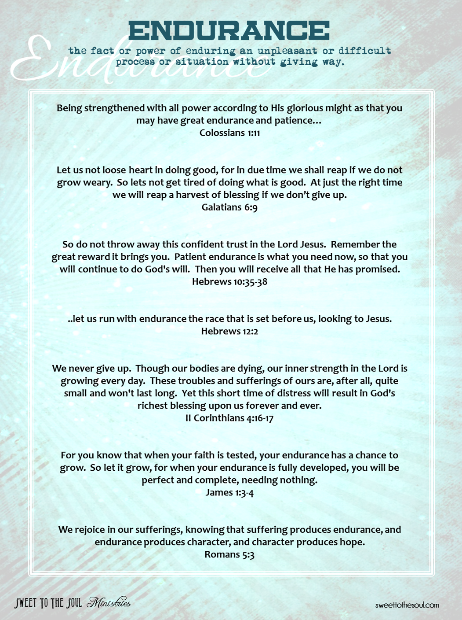 So here are 7 scriptures I pray will lift and support as you rely on God's strength for endurance. 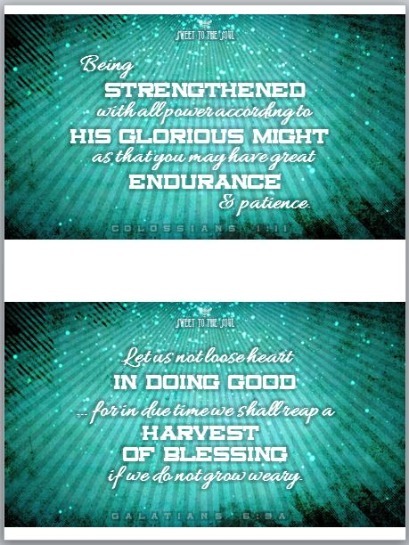 Let us not loose heart in doing good, for in due time we shall reap if we do not grow weary. So lets not get tired of doing what is good. At just the right time we will reap a harvest of blessing if we don’t give up. So do not throw away this confident trust in the Lord Jesus. Remember the great reward it brings you. 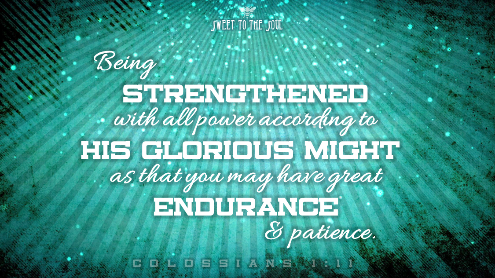 Patient endurance is what you need now, so that you will continue to do God's will. Then you will receive all that He has promised. ..let us run with endurance the race that is set before us, looking to Jesus. We never give up. Though our bodies are dying, our inner strength in the Lord is growing every day. These troubles and sufferings of ours are, after all, quite small and won't last long. Yet this short time of distress will result in God's richest blessing upon us forever and ever. For you know that when your faith is tested, your endurance has a chance to grow. So let it grow, for when your endurance is fully developed, you will be perfect and complete, needing nothing. We rejoice in our sufferings, knowing that suffering produces endurance, and endurance produces character, and character produces hope. ​​Jana Kennedy-Spicer is a blogger, graphic artist, Bible teacher and speaker passionate about inspiring and encouraging women on their daily walk with Christ. THANK YOU! PRINTING THE PAGE SPREAD NOW!!!!!!!!!!!!!!!!!!!!!!!!! Am printing of the printable for my quiet time space. Thanks again! It Is All a Gift!